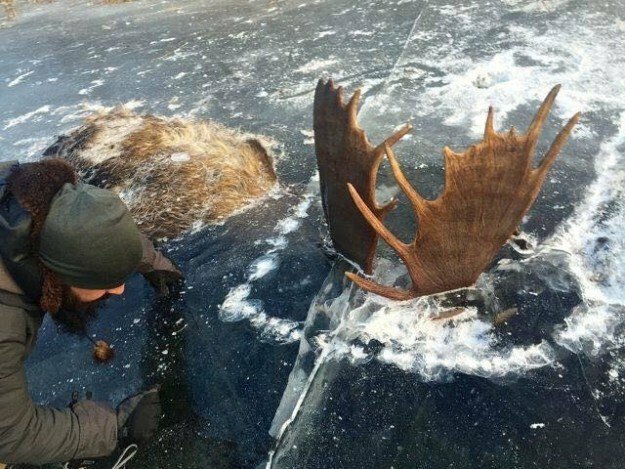 In fact, Erickson wrote a few days later that the moose had been removed from the ice. “Now to get them cleaned up,” he wrote. Finding and removing the moose was “likely [a] once in a lifetime experience,” he added. The moose was first found by Erickson’s friend Brad Webster, a science and social studies teacher who was touring the grounds of a Bible camp that he maintains with a friend named Chris, who was new to Alaska. There’s a good chance they drowned in the frigid water, which quickly hardened to ice as temperatures dropped, the friends wrote. (See why moose are butting heads on a suburban street). Bill Samuel, a retired biologist and moose expert at the University of Alberta in Canada says he has never seen anything quite like it, though he is aware that the strength of the powerful animals and irregular shapes of their antlers can occasionally result in tangling that the animals can’t escape.